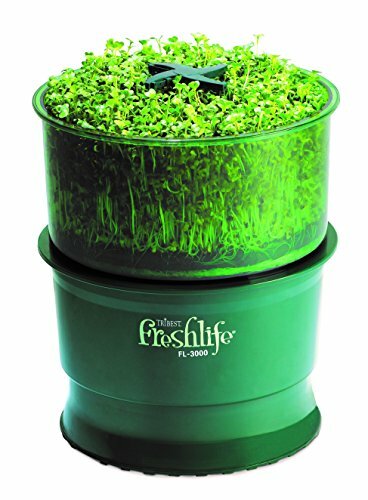 The Tribest Freshlife FL-3000 Automatic Sprouter makes it even easier to grow and enjoy fresh organically grown sprouts all year round. Just fill it with water, add seeds, plug it in and switch it on to have fresh nutritious sprout in just 5-8 days. The Freshlife's automatic watering system waters your sprouts intermittently throughout the day by watering for 5 minutes, resting for 25 minutes, then repeating. With the new adjustable water pressure system and powerful motor, you can now sprout up to three barrels at a time, making it easier and faster to harvest delicious sprouts in your own kitchen. There's no soil, no hassle and no green thumb required. If you have any questions about this product by Tribest, contact us by completing and submitting the form below. If you are looking for a specif part number, please include it with your message.